Sisters? Call Robert Sack on 1800 876 5353. RD is happy Old Man Vince is (attempting to) bring back the XFL. Blade compares him to his ventriloquist dummy. Maybe next they'll think of him as a cigar store Indian. 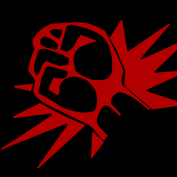 The Fruitcakes are attempting to go monthly due to some promised Patreon milestone. They are now (as of recording) 62% on the way to do fortnightly progrems. Remember when they used to do weekly shows for free? Ahhh how times change. RD calls for any drug addict listeners to help out and aid in the support. Blade would be a (horrible) maid for more funding, or so he says. RD thinks they should explain their shows to newer listeners. Perhaps use a glossary? (:07) "It's kind of a variety show. If you're clicking on this and you think you're going to get for the next hour and fifteen minutes, hour and a half, whatever we run; if you think it's going to be non stop wrestling news and I'm going to be talking about the women of SHIMMER or what happened at Wrestle Kingdom 12? SPOILER ALERT! You're going to be very disappointed." Promotional Consideration is paid for by...Mike Check! (:09) Blade makes him explain his "gimmick Brad". He then reads my ad copy for a change. Excuse me. The ad copy of a "mysterious benefactor" named Premier Blake. 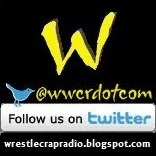 (Funny thing is that Mike Check promoted us here at wrestlecrapradio.com but not his own show that we produced. 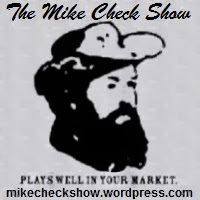 A little show called "The Mike Check Show?" --Raging_Demons) He sounds like my mirror universe counterpart. Does he have a goatee? Mike then complains about his own royalty checks. 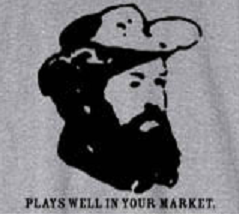 He was once in Macon Georgia as Bobby Peach. "If you shake my peaches you'll see my cream!" was his slogan there. He leaves with Mary McGregor. Blade breaks out laughing. :15 Gayle's Root Beer has a Peeping Tom dog, "Oh rudie!" and tastes like awful cough syrup. Blade does his disgraced former comedic icon impression. RD remarks how far ahead they were with him. It is also really remarkable how much of a portent he was leading to a bigger revelation of sexual crimes and the fallout from all that. 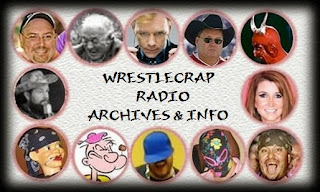 The Faxtrolla signals "nothing but the most obscure wrestling news imaginable" according to Blade. (:21) Christy Hemme who RD considers wild has given birth. The BabyTrolla cuts off Blade's catchphrase. Christy Hemme who RD considers wild has given birth. The BabyTrolla cuts off Blade's catchphrase. Christy Hemme who RD considers wild has given birth. The BabyTrolla cuts off Blade's catchphrase. Christy Hemme who RD considers wild has given birth. Blade thinks her short but RD discovers she's taller than his Patty and equal to his Mickie. "HeightChecker34" disputes that. "Sam Rick" had a video game one time. Blade thinks people should discuss and debate their heights. Also one of the newborns seems to has a double name. Blade does an Alabamian David Bowie. Tammy has been discussed a hell of a lot lately notes RD. She's now on OfferUp as Tamara. Now with 50% less chance of nudes stealing! (:37) The listings include some love furniture for sale. Sir Alec reads one of her Facebook posts extolling her love for her new boyfriend...and rather creeping asking for a marriage. Oh well. (:42) Speaking of love Alec's been happy with Ellie of late. RD is temporarily stopped by laughter. Chris McGinnis thinks the Boogeyman should have been more stealthy. (:55) Like me RD is not a big fan of stealth games. Blade is too distracted by 15+ year old bad movies. Colliseum Video may return to WWE Network at a later date. Good news: without RD ejaculating. Bad news: potentially without the famous theme music. (:58) Blade remembers CV's parent company also released some X rated stuff which sadly he did not own. The first ever 30 Women Royal Rumble is just around the corner. RD reads some names, including Mickie James. "Good to know." One possible woman contestant premiered at the same show as the Midnight Rose. :67 "Three Count with RD & Blade" has a bad bell sound. The two think on which remaining three women will complete the roster. RD thinks it would be the Deever, Anonymous Brooke and Kelly Kelly - AKA an Extreme Exposé run in. Blade has Kimberly Page (who's been MIA, speaking of mysteries) (No mystery at all. SOURCES HAVE TOLD THIS reporter that Kimberly Page took out those breasts implants of her and is currently in Park City, Utah working in marketing and does interior decorating. WAIT A MINUTE! That's close by to where I live, kinda. 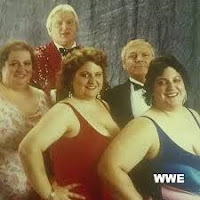 --Raging_Demons), Daisy of GLOW who threw around a dead blow up doll of an opponent one time, and two of Scott Steiner's ladies. RD got his Draft Queen voice back to cover the XFL (assuming it'll actually return). (:78) She still thinks Tim Tebow will make a comeback to football there when he gets tired of the glory that is Minor League Baseball with the Mets. Not a good decision Vince.